This is part 3 of 3 part series on Supply Management. Despite the best of intentions, any supply management program comes with challenges. 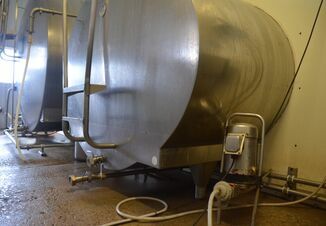 Take the case of Prairie Farms Dairy, Inc., based in Edwardsville, Ill. It announced a base-management program, along with penalties if member-producers exceeded their monthly base allotments, a year ago. It initially said the base itself would have no value and could not be bought or sold. The program began Oct. 1, 2017. Within months, the co-op succumbed to member pressure to allow the sale of base, though 25% of the base would be cancelled if a farmer sells his base. By early 2018, base had taken on value to the tune of $8/cwt based on monthly production, according to anecdotal reports. (Note: Prairie Farms has declined to comment publicly on its quota program.) That came to $160/cow for a cow producing 2,000 lb/month (or 24,000 lb/year). That cost is off-set somewhat by $2/cwt penalty imposed on a dairy farmer who was shipping up to 10,000 lb/month over his monthly base allotment. The over-base penalty rises with the pounds of milk over base. At 20,000 to 50,000 lb over base, the penalty is $8/cwt. For farms to offset that, they’d need to purchase quota for 10 to 20 cows. 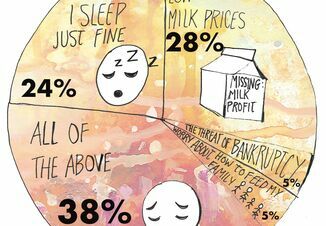 Even modest supply management programs, such as the one promoted by the National Milk Producers Federation in its “Foundation for the Future” (FFTF) plan, has unintended consequences. Note that FFTF was the precursor to the Dairy Margin Protection Program, and had as one of its four principles an on-again/off-again supply management plan. If margins fell low enough and payments triggered, farmers would have supply management imposed until margins improved to more profitable levels. The program was analyzed by economists Joseph Balagtas and Daniel Sumner from Purdue University and the University of California, respectively. Their conclusion: “Such a supply management scheme may do little to reduce short-run margin variability. 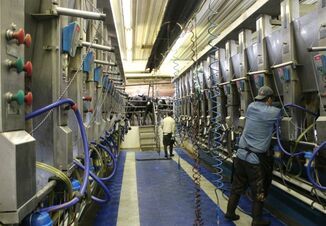 Lags in milk production and pricing are such that the price bump from limiting output is likely to come months after the observation of the tight margin that triggered the quota.